As we reach the outermost edge of the Wild Ones‘s land, a range of snow-coated mountains separating it from the rest of the world, we sigh as our journey nears its end. But wait, we still haven’t spotted the most prolific and still strangely elusive creature from Kidrobot‘s first Dunny series of 2018. And then we glance a fur-covered form running in the distance, as if emerging straight from creator Spanky Stokes‘ mind. Yes, we’ve entered Stroll territory. And what is a Stroll? Created by Californian John Adams Stokes III, more commonly known as John “Spanky” Stokes (or simply Spanky Stokes), this professional graphic designer’s Stroll has become the mascot of his SpankyStokes.com website. Founded in 2007, when Stokes discovered the designer toy movement, it would be more than a year later that he earnestly began posting on the site. And since then he has risen to being one of the preeminent sources for news concerning art toys. While the Stroll, or “Stokes Troll”, image became synonymous with the site since first being placed in the header circa the end of 2008, the concept actually predates this. Earlier that year, Stokes became involved in trades between artists on the Kidrobot forum, each offering a uniquely altered Dunny for the same. Enticed by the creative expression this allowed him, the second designer toy piece he ever modified was for May of 2008’s Message Board Custom Dunny Trade 7 and it was titled the Stroll Dunny, its appearance loosely reminiscent of the creature’s form as it appears now. Following that, Stokes conceived a variety of vinyl forms hand-altered with faux fur, glass eyes, and sculpted teeth, most using the term “Stroll” in their title. 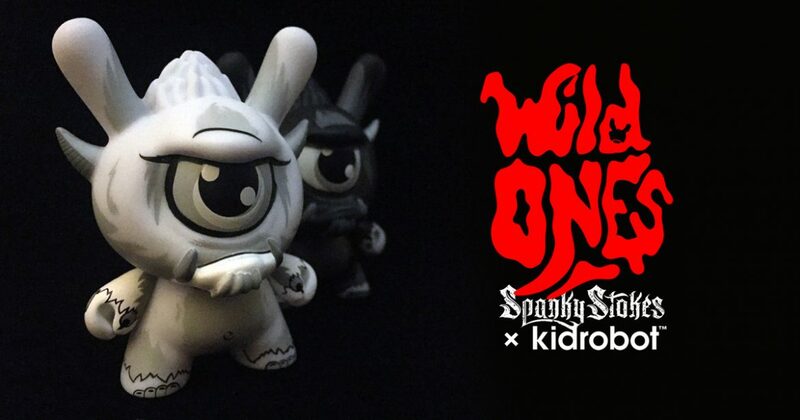 And, after incorporating the creature into his website’s aesthetic, he’d collaborate on translating the concept into a multitude of handmade and production interpretations, the most recent being the renditions for Kidrobot’s Wild Ones series. Perhaps the most ferocious looking monster within the factory-made Wild Ones bestiary, the Stroll design employs a sculpted Dunny head made specifically for it. With a furled brow over its cycloptic eye, these creatures have a goateed lower lip jutting forth, tusk-like teeth emerging from the edges of the mouth. Topped with a mussed tuft of hair and two grooved horns, the clawed hand patterning on its arms is painted in place as is the adorably bulbous exposed bum on its backside. Most commonly found in its Yeti-inspired white coloration, there is a slightly more uncommon Midnight rendition, a dark toned interpretation perfect for blending into the darkest night. And then there is the elusive and mysterious Blood version, the Stroll’s normally non-violent demeanor having given way to its primal urges. Having found a twisting path through the snow-dusted peaks, we prepare to end our expedition through the region populated by the Wild Ones. But, just as a return to civilization is in our sights, a truly blessed final encounter occurs. Spotted looming in the highest cliffs of the mountain range surrounding us, we see the chilly Ice edition of the Stroll, its bright blue glow-in-the-dark form only being available as a gift with purchase to the first 50 collectors to acquire a full display box from Kidrobot.com as well as from some select retailers.